While a mass is travelling at increasing speeds, the air of the environment affects its movement. Spoilers in racing are used in combination with other features on the body or chassis of race cars to change the handling characteristics that are affected by the air of the environment. Often, these devices are designed to be highly adjustable to suit the needs of racing on a given track or to suit the talents of a particular driver, with the overall goal of reaching faster times. The goal of many spoilers used in passenger vehicles is to reduce drag and increase fuel efficiency. Passenger vehicles can be equipped with front and rear spoilers. Front spoilers, found beneath the bumper, are mainly used to decrease the amount of air going underneath the vehicle to reduce the drag coefficient and lift. Sports cars are most commonly seen with front and rear spoilers. Even though these vehicles typically have a more rigid chassis and a stiffer suspension to aid in high speed maneuverability, a spoiler can still be beneficial. This is because many vehicles have a fairly steep downward angle going from the rear edge of the roof down to the trunk or tail of the car which may cause air flow separation. 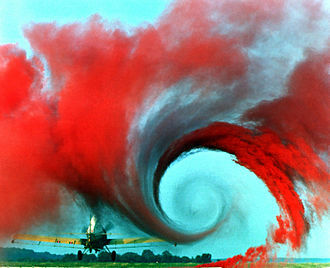 The flow of air becomes turbulent and a low-pressure zone is created, increasing drag and instability (see Bernoulli effect). Adding a rear spoiler could be considered to make the air "see" a longer, gentler slope from the roof to the spoiler, which helps to delay flow separation and the higher pressure in front of the spoiler can help reduce the lift on the car by creating downforce. This may reduce drag in certain instances and will generally increase high speed stability due to the reduced rear lift. Due to their association with racing, spoilers are often viewed as "sporty" by consumers. However, "the spoilers that feature on more upmarket models rarely provide further aerodynamic benefit." ABS plastic: Most original equipment manufacturers produce spoilers by casting ABS plastic with various admixtures, typically granular fillers, which introduce stiffness to this inexpensive material. Frailness is a main disadvantage of plastic, which increases with product age and is caused by the evaporation of volatile phenols[further explanation needed]. Fiberglass: Used in car parts production due to the low cost of the materials. Fiberglass spoilers consist of fiberglass cloth infiltrated with a thermosetting resin, such as epoxy. Fiberglass is sufficiently durable and workable, but has become unprofitable for large-scale production because of the labor involved. Silicone: More recently, many auto accessory manufacturers are using silicon-organic polymers. The main benefit of this material is its phenomenal plasticity. Silicone possesses extra high thermal characteristics and provides a longer product lifetime. Carbon fiber: Carbon fiber is lightweight and durable but also expensive. Due to the large amount of manual labor, large-scale production cannot widely use carbon fiber in automobile parts currently. Front spoilers: A front spoiler (air dam) is positioned under or integrated with the front bumper. In racing, this spoiler is used to control the dynamics of handling related to the air in front of the vehicle. This can be to improve the drag coefficient of the body of the vehicle at speed, or to generate downforce. In passenger vehicles, the focus shifts more to directing the airflow into the engine bay for cooling purposes. Pickup Truck bed spoiler: This attaches only to the top of the truck bed rails near the rear. Used with a bed cover, this spoiler is intended to reduce the air profile of the steep drop-off from the tailgate. Pickup truck cab spoiler: This is purposed the same as above, except focusing on the drop-off from the cab of the truck to the cargo bed. An active spoiler is one which dynamically adjusts while the vehicle is in operation based on conditions presented, changing the spoiling effect, intensity or other performance attribute. Found most often on sports cars and other passenger cars, the most common form is a rear spoiler which retracts and hides partially or entirely into the rear of the vehicle, then extends upwards when the vehicle exceeds a specific speed. 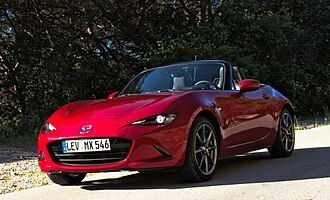 Active front spoilers have been implemented on certain models as well, in which the front spoiler or air dam extends further towards the road below to reduce drag at high speed. In most cases the deployment of the spoiler is achieved with an electric motor controlled automatically by the onboard computer or other electronics, usually based on vehicle speed, driver setting or other inputs. Often the driver can manually deploy the spoiler if desired, but may not be able to retract the spoiler above a certain speed because doing so could dangerously diminish the high-speed handling qualities of the vehicle. Active spoilers can offer additional benefits over fixed spoilers. Cosmetically, they can allow a cleaner or less cluttered appearance when the vehicle is parked or traveling at low speeds, when it is most likely to be observed. A spoiler which hides may be appealing to vehicle designers who are seeking to improve the high-speed aerodynamics of an iconic or recognizable model (for example the Porsche 911 or Audi TT), without drastically changing its appearance. Hiding a spoiler at low speeds can improve aerodynamics as well. At low speeds a fixed spoiler may actually increase drag, but does little to improve the handling of the vehicle due to having little airflow over it. A retractable front spoiler can reduce scraping of the car on curbs or other road imperfections, while still improving drag at high speeds. Heavy trucks, like long haul tractors, may also have a spoiler on the top of the cab in order to lessen drag caused from air resistance from the trailer it's towing, which may be taller than the cab and reduce the aerodynamics of the vehicle dramatically without the use of this spoiler. The trailers they pull can also be fitted with under-side spoilers that angle outward to deflect passing air away from the rear axle's wheels. Trains may use spoilers to induce drag (like an air brake). 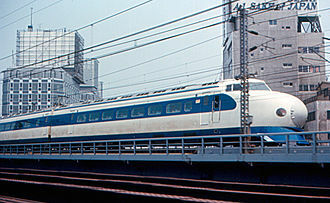 A prototype Japanese high-speed train, the Fastech 360, is designed to reach speeds of 400 kilometres per hour (250 mph). Its nose is specifically designed to spoil a wind effect associated with passing through tunnels, and it can deploy 'ears' which act to slow the train in case of emergency by increasing its drag. Some modern race cars employ a passive situational spoiler called a roof flap. The body of the car is designed to generate downforce while driving forward. These roof flaps deploy when the body of the car is rotated so it is traveling in reverse, a condition where the body instead generates lift. The roof flaps deploy because they are recessed into a pocket in the roof. The low pressure above this pocket will cause the flaps to deploy, and counteract some of the lift generated by the car, making it more resistant to coming out of contact with the ground. These devices were introduced in 1994 in NASCAR following Rusty Wallace's crash at Talladega. When the Porsche 911 Turbo debuted in August 1974, with large, flared, rear spoilers, they were immediately dubbed whale tails. Designed to reduce rear-end lift and so keep the car from oversteering at high speeds, the rubber edges of the whale tail spoilers were thought to be "pedestrian friendly". The Turbo with its whale tail was popular. It also became one of the world's most recognizable sports cars, remaining in production for the next two decades in one form or another, with more than 23,000 sold by 1989, although from 1978, the rear spoiler was redesigned and dubbed 'teatray' on account of its raised sides. 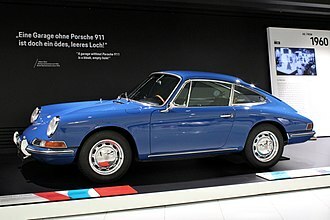 The Porsche 911 whale tails were used in conjunction with a chin spoiler attached to the front valence panel, which, according to some sources, did not enhance aerodynamic stability. It has been found to be less effective in multiplying downforce than newer technologies like an airfoil, "rear wing running across the base of the tailgate window", or "an electronically controlled wing that deploys at about 50 mph" (80 km/h). The whale tail came on the heels of the 1973 "duck tail" or Bürzel in German (as a part of the E-program), a smaller and less flared rear-spoiler fitted to 911 Carrera RS (meaning Rennsport or race sport in German), optional outside Germany. The whaletail was originally designed for Porsche 930 and Porsche 935 race cars in 1973, and introduced to the Turbo in 1974 (as a part of the H-program); it was also an option on non-turbo Carreras from 1975. Both types of spoilers were designed while Dr. Ernst Fuhrmann was serving as the Technical Director of Porsche AG. In 1976, a rubber front chin spoiler was also introduced to offset the more effective spoiler. By 1978, Porsche introduced another design for the rear spoiler, the "teatray", a boxier enclosure which accommodated the intercooler, and was also an option for the 911SC. These whale tail car spoilers of the Porsche 911 caught on as a fashion statement, and the term has been used to refer to large rear spoilers on a number of automobiles, including Ford Sierra RS, Focus, Chevrolet Camaro, and Saab 900. Whale tail spoilers also appear at the rear of tricycles, trucks, boats, and other vehicles. Wikimedia Commons has media related to Automobile spoilers. ^ Katz, Joseph. Race Car Aerodynamics. Bentley Robert. p. 99. ISBN 0837601428. ^ Katz, Joseph. Race Car Aerodynamics. Bentley Robert. pp. 208–209. ISBN 0837601428. ^ "Why a Spoiler for Your Car? : Fuel Economy, Styling, Value Enhancement". Cardata.com. Archived from the original on 2011-10-30. Retrieved 2011-09-28. ^ Happian-Smith, Julian (2000). Introduction to Modern Vehicle Design. Elsevier. p. 116. ISBN 9780080523040. Retrieved 19 March 2016. ^ "Jayski's Silly Season Site - Past News Page". Jayski.com. 2005. Retrieved 2013-08-03. ^ a b c Dempsey, Wayne R. (2001). 101 Projects for Your Porsche 911. MotorBooks/MBI Publishing. p. 198. ISBN 0-7603-0853-5. ^ a b Anderson, Bruce (1997). Porsche 911 Performance Handbook. MotorBooks/MBI Publishing. p. 16. ISBN 0-7603-0033-X. ^ a b Morgan, Peter; Colley, John; Hughes, Mark (1998). Original Porsche 911: The Guide to All Production Models, 1963-98. MotorBooks/MBI Publishing. pp. 144–160. ISBN 1-901432-16-5. ^ Lewis, Albert L.; Musciano, Walter A. (1977). Automobiles of the World. Simon and Schuster. p. 660. ISBN 0-671-22485-9. ^ Paternie, Patrick (2005). Porsche 911 Red Book 1965-2005: 1965-2005. MotorBooks/MBI Publishing. p. 45. ISBN 0-7603-1960-X. ^ Faragher, Scott (2005). Porsche the Ultimate Guide. Krause Publications. p. 50. ISBN 0-87349-720-1. ^ Paternie, Patrick (2005). Porsche 911 Red Book 1965-2005: 1965-2005. MotorBooks/MBI Publishing. p. reface. ISBN 0-7603-1960-X. ^ Anderson, Bruce (1997). Porsche 911 Performance Handbook. MotorBooks/MBI Publishing. p. 16. ISBN 0-7603-0033-X. ^ Dempsey, Wayne R. (2001). 101 Projects for Your Porsche 911: 1964-1989. MotorBooks/MBI Publishing. p. 200. ISBN 0-7603-0853-5. ^ Post, Robert C. (2001). High Performance: The Culture and Technology of Drag Racing, 1950-2000. JHU Press. p. 229. ISBN 0-8018-6664-2. ^ Sturmey, Henry; Staner, H. Walter (1986). The Autocar. Iliffe, Sons & Sturmey. p. 6. ^ Batchelor, Dean; Leffingwell, Randy (1997). Illustrated Porsche Buyer's Guide. MotorBooks/MBI Publishing. p. 84. ISBN 0-7603-0227-8. ^ Faragher, Scott (2005). Porsche the Ultimate Guide. Krause Publications. p. 49. ISBN 0-87349-720-1. ^ Leffingwell, Randy (2002). Porsche Legends. MotorBooks/MBI Publishing. p. 144. ISBN 0-7603-1364-4. ^ Faragher, Scott (2005). Porsche the Ultimate Guide. Krause Publications. p. 52. ISBN 0-87349-720-1. ^ O'Rourke, P.J. (2000). Holidays in Hell. Grove Press. p. 207. ISBN 0-8021-3701-6. ^ Robson, Graham (2001). The Illustrated Directory of Classic Cars. MotorBooks/MBI Publishing. p. 228. ISBN 0-7603-1049-1. ^ "Rear spoilers". Showcars Bodyparts. Retrieved 2008-07-26. ^ "Classic Saab Whale Tail restoration" (PDF). Saab Commemorative Edition Website. Retrieved 2008-07-26. ^ "Hannigan Trikes". EasyCart.net. Retrieved 2008-07-26. ^ "Universal Whale Tail Truck Spoilers". URL.biz. Archived from the original on 2008-09-07. Retrieved 2008-07-26. ^ Perry, Bob. "Classic Swan". Boats.com. Dominion Enterprises. Archived from the original on 2008-10-03. Retrieved 2008-07-26. Carbon fiber reinforced polymer, carbon fiber reinforced plastic or carbon fiber reinforced thermoplastic, is an extremely strong and light fiber-reinforced plastic which contains carbon fibers. The spelling fibre is common in British Commonwealth countries, the binding polymer is often a thermoset resin such as epoxy, but other thermoset or thermoplastic polymers, such as polyester, vinyl ester or nylon, are sometimes used. The composite may contain other fibers, such as an aramid, ultra-high-molecular-weight polyethylene or glass fibers, the properties of the final CFRP product can be affected by the type of additives introduced to the binding matrix. The most frequent additive is silica, but other such as rubber. The material is referred to as graphite-reinforced polymer or graphite fiber-reinforced polymer. In product advertisements, it is referred to simply as graphite fiber for short. In this case the composite consists of two parts, a matrix and a reinforcement, in CFRP the reinforcement is carbon fiber, which provides the strength. The matrix is usually a resin, such as epoxy. Because CFRP consists of two elements, the material properties depend on these two elements. The reinforcement will give the CFRP its strength and rigidity, measured by stress, unlike isotropic materials like steel and aluminum, CFRP has directional strength properties. The properties of CFRP depend on the layouts of the carbon fiber, the following equation, E c = V m E m + V f E f is valid for composite materials with the fibers oriented in the direction of the applied load. Typical epoxy-based CFRPs exhibit virtually no plasticity, with less than 0. 5% strain to failure, although CFRPs with epoxy have high strength and elastic modulus, the brittle fracture mechanics present unique challenges to engineers in failure detection since failure occurs catastrophically. As such, recent efforts to toughen CFRPs include modifying the existing epoxy material, One such material with high promise is PEEK, which exhibits an order of magnitude greater toughness with similar elastic modulus and tensile strength. The short-lived Plymouth Superbird was a highly modified version of the Plymouth Road Runner with well-known graphics and horn. The cars primary rival was the Ford Torino Talladega, a response to the Mopar aero car. It has been speculated one motivating factor in the production of the car was to lure Richard Petty back to Plymouth. Both of the Mopar aero cars famously featured a protruding, aerodynamic nosecone, a rear wing and, in the case of the Superbird. Superbirds equipped with the top-of-the-line 426 cu in Hemi engine with a pair of four barrel Carter AFB carburettors producing 425 hp could accelerate from 0 to 60 mph in 5.5 seconds. Developed specifically for NASCAR racing, the Superbird, a modified Road Runner, was Plymouths follow-on design to the Charger Daytona fielded by sister company Dodge in the previous season. The Superbirds smoothed-out body and nosecone were further refined from that of the Daytona, the rear wing was mounted on tall vertical struts that put it into less disturbed air thus increasing the efficiency of the downdraft that it placed upon the cars rear axle. For nearly 30 years the formula used to determine the exact height of the enormous wing was thought to be a highly guarded Chrysler secret. In the 1990s a retired Chrysler project engineer claimed publicly that the height was determined in much simpler fashion and it should be noted that by a co-incidence the height of the wing was at the optimum level for maximum downforce. The rear-facing fender scoops were to hide cut outs and these cutouts were to allow wheel clearance due to the larger, wider wheels and lowered height of the vehicle for NASCAR. On Daytonas, the scoops were actually for ventilating trapped air from the wells in order to reduce under fender air pressure. For standard road going Superbirds the covers or air extractors were a cosmetic enhancement, NASCARs homologation requirement demanded that vehicles to be raced must be available to the general public and sold through dealerships in specific minimum numbers. Due to increasing emissions regulations, combined with insurance hikes for high performance cars, Superbird decals were placed on the outside edges of the spoiler vertical struts featuring a picture of the Road Runner cartoon character holding a racing helmet. The Porsche 930 is a sports car built by Porsche between 1975 and 1989, known to the public as the 911 Turbo. It was the makers top-of-the-range 911 model for its entire production duration, Porsche began experimenting with turbocharging technology on their race cars during the late 1960s, and in 1972 began development on a turbocharged version of the 911. 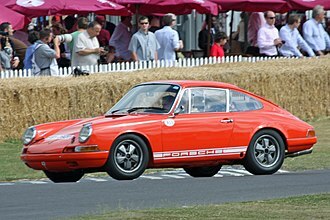 Porsche originally needed to produce the car in order to comply with regulations and had intended on marketing it as a street legal race vehicle like the 1973 Carrera 2.7 RS. The FIAs Appendix “J” rules that brought about the 911 Turbo Carrera RSR2.1 in 1974 changed in 1975 and 1976. The FIA announced that cars for Group 4 and Group 5 had to be production cars, for the 1976 season, new FIA regulations required manufactures to produce 400 cars in twenty-four months to gain approval for Group 4. 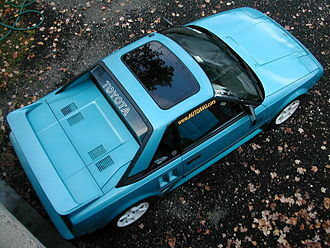 Group 5 would require the car to be derived from a model in Group 3 or 4. Porsches group 4 entry was the 934, homologated on 6 December 1975, for Group 5, Porsche would create one of the most successful racing cars of all time, the 935. While the original purpose of the Porsche Turbo road car was to gain homologation for the 1976 racing season,400 cars were produced by the end of 1975. Since Porsche wanted to be racing for the 1976 season, they gained FIA homologation for the Porsche Turbo for Group 4 in Nr.645 on 6 Dec ‘75 and the 1, 000th 1976 Turbo was completed on 5 May ‘76. Ernst Fuhrmann adapted the turbo-technology originally developed for the 917/30 CAN-AM car to the 3.0 litre flat-six from the Carrera RS3.0, total output from the engine was 260 PS, much more than the standard Carrera. Porsche badged the vehicle simply as Turbo and debuted it at the Paris Auto Show in October 1974 before putting it on sale in the spring of 1975, export to the United States began in 1976. The 930 proved very fast but very demanding to drive fast, prone by its short wheelbase, rear engine layout to oversteer and turbo-lag. Porsche made its first and most significant changes to the 930 for 1978, enlarging the engine to 3.3 litres and adding an air-to-air intercooler. They are typically heat-resistant and rubber-like, and are used in sealants, lubricants, cooking utensils, and thermal and electrical insulation. Some common forms include silicone oil, silicone grease, silicone rubber, silicone resin, more precisely called polymerized siloxanes or polysiloxanes, silicones consist of an inorganic silicon-oxygen backbone chain with organic side groups attached to the silicon atoms. So, silicones are polymers constructed from inorganic-organic monomers, Silicones have in general the chemical formula n, where R is an organic group such as alkyl groups, or phenyl groups. In some cases, organic side groups can be used to two or more of these -Si-O- backbones together. By varying the -Si-O- chain lengths, side groups, and crosslinking, silicones can be synthesized with a variety of properties. They can vary in consistency from liquid to gel to rubber to hard plastic, the most common siloxane is linear polydimethylsiloxane, a silicone oil. The second largest group of materials is based on silicone resins. F. S.
Kipping and Matt Saunders coined the word silicone in 1901 to describe polydiphenylsiloxane by analogy of its formula, Ph2SiO, with the formula of the ketone benzophenone, Ph2CO. Kipping was well aware that polydiphenylsiloxane is polymeric whereas benzophenone is monomeric and noted that Ph2SiO, Silicone is sometimes mistakenly referred to as silicon. The chemical element silicon is a crystalline metalloid widely used in computers, polysiloxanes are among the many substances commonly known as silicones. Molecules containing silicon-oxygen double bonds do exist and are called silanones, despite this, silanones are important as intermediates in gas-phase processes such as chemical vapor deposition in microelectronics production, and in the formation of ceramics by combustion. Most common are materials based on polydimethylsiloxane, which is derived by hydrolysis of dimethyldichlorosilane and this dichloride reacts with water as follows, n Si2Cl2 + n H2O → n + 2n HCl The polymerization typically produces linear chains capped with Si-Cl or Si-OH groups. Fiberglass is a type of fiber-reinforced plastic where the reinforcement fiber is specifically glass fiber. The glass fiber may be arranged, flattened into a sheet. 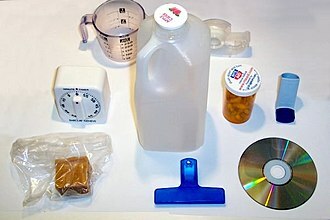 The plastic matrix may be a polymer matrix – most often based on thermosetting polymers such as epoxy, polyester resin. The glass fibers are made of various types of glass depending upon the fiberglass use and these glasses all contain silica or silicate, with varying amounts of oxides of calcium and sometimes boron. To be used in fiberglass, glass fibers have to be made very low levels of defects. Fiberglass is a lightweight material and is used for many products. Although it is not as strong and stiff as composites based on fiber, it is less brittle. Its bulk strength and weight are better than many metals, other common names for fiberglass are glass-reinforced plastic, glass-fiber reinforced plastic or GFK. Because glass fiber itself is referred to as fiberglass, the composite is called fiberglass reinforced plastic. This article will adopt the convention that fiberglass refers to the glass fiber reinforced composite material. A patent for this method of producing glass wool was first applied for in 1933, Owens joined with the Corning company in 1935 and the method was adapted by Owens Corning to produce its patented fibreglas in 1936. Originally, fibreglas was a wool with fibers entrapping a great deal of gas, making it useful as an insulator. A suitable resin for combining the fibreglass with a plastic to produce a material was developed in 1936 by du Pont. 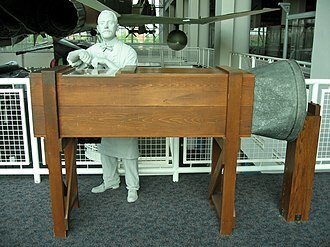 The first ancestor of modern polyester resins is Cyanamids resin of 1942, peroxide curing systems were used by then. With the combination of fiberglass and resin the gas content of the material was replaced by plastic and this reduced the insulation properties to values typical of the plastic, but now for the first time the composite showed great strength and promise as a structural and building material. Confusingly, many glass fiber composites continued to be called fiberglass, ray Greene of Owens Corning is credited with producing the first composite boat in 1937, but did not proceed further at the time due to the brittle nature of the plastic used. 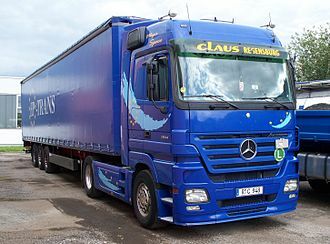 A semi-trailer truck, more commonly called a semi truck, is the combination of a tractor unit and one or more semi-trailers to carry freight. A semi-trailer attaches to the tractor with a fifth wheel hitch, the result is that both tractor and semi-trailer will have a distinctly different design than a rigid truck and trailer. 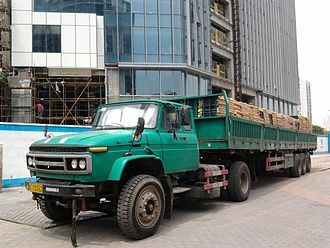 The tractor unit typically has two or three axles, those built for hauling heavy-duty commercial-construction machinery may have as many as five, the most common tractor-cab layout has a forward engine, one steering axle, and two drive axles. The fifth-wheel trailer coupling on most tractor trucks is movable fore and aft, ubiquitous in Europe, but less common in North America since the 1990s, is the cabover engine configuration, where the driver sits next to, or over the engine. With changes in the US to the length of the combined vehicle. Cabovers were difficult to service, as the cab could not be lifted on its hinges to a full 90-degree forward tilt, Trucks average from 4 to 8 miles per US gallon, with fuel economy standards requiring better than 7 miles per US gallon efficiency by 2014. The cargo trailer usually has tandem axles at the rear, each of which has wheels, or eight tires on the trailer. In the US it is common to refer to the number of hubs, rather than the number of tires. The combination of eight tires on the trailer and ten tires on the tractor is what led to the moniker eighteen wheeler, many trailers are equipped with movable tandem axles to allow adjusting the weight distribution. To connect the second of a set of doubles to the first trailer, and to support the front half of the second trailer and this has one or two axles, a fifth-wheel coupling for the rear trailer, and a tongue with a ring-hitch coupling for the forward trailer. Individual states may further allow longer vehicles, known as longer combination vehicles, Long Combination Vehicle types include, Two 28.5 ft trailers. Turnpike Doubles, Two 48 ft trailers, Rocky Mountain Doubles, One 40 to 53 ft trailer and one 28.5 ft trailer. In Canada, a Turnpike Double is two 53 ft trailers, and a Rocky Mountain Double is a 50 ft trailer with a 24 ft pup, future Long Combination Vehicles under consideration and study for the U. S. MAP-21 transportation bill are container doubles. The Chrysler Crossfire is a rear-wheel drive, 2-door sports car sold by Chrysler and built by Karmann of Germany for model years 2004-2008. 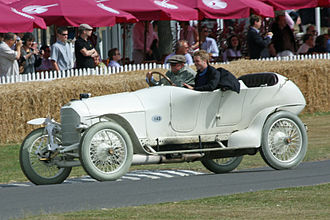 Developed during the union of Daimler and Chrysler, the two-seater is based on the Mercedes-Benz R170 platform and shares 80% of its components with the first generation SLK. The second generation SLK was built on a new R171 platform starting in the 2005 model year, having initially arrived in 2001 as a concept car styled by Eric Stoddard, the Chrysler was further refined by Andrew Dyson before production began in 2003 for 2004 model year sales. The name Crossfire refers to the two lines that run from front to rear along the body sides — crossing each other midway through the door panel. Conceived during the period of Chryslers ownership by Daimler-Benz, the name refers to the collaboration of the two companies. The Crossfires fastback roof and broad rear fenders made for a rear end design that prompted automotive journalists, the distinctive boat-tail rear end that reminds more than one observer of the old Rambler Marlin. When I first espied the rear lines of the Chrysler Crossfire I was instantly transported back to 1965 and my favorite car of that year, motor Trend compared the provocative boattail theme of the 2004 Crossfires sheetmetal to that of the AMC Marlin fastback. However, British motoring journalist Jeremy Clarkson had a less kind interpretation of the Crossfires design, Chrysler executed the interior and exterior styling. All other elements of the car such as wheelbase, engine, chassis structure, an example of this is the engine bay of the Crossfire, which is virtually identical to the Mercedes-Benz SLK320 on the R170 platform. The seats from the Mercedes-Benz SLK320 would bolt directly into the Crossfire chassis, the dashboard layout and instruments are similar to those on the Mercedes-Benz SLK320. The standard transmission is a 6-speed manual with an optional 5-speed automatic. Base and Limited models, originally beginning in the 2004 model year, are equipped with a Mercedes-Benz 3.2 L, 18-valve. SRT-6 models are equipped with a supercharged version of the engine built by AMG. Turbulence or turbulent flow is a flow regime in fluid dynamics characterized by chaotic changes in pressure and flow velocity. It is in contrast to a flow regime, which occurs when a fluid flows in parallel layers. Turbulence is caused by kinetic energy in parts of a fluid flow. For this reason turbulence is easier to create in low viscosity fluids, in general terms, in turbulent flow, unsteady vortices appear of many sizes which interact with each other, consequently drag due to friction effects increases. This would increase the energy needed to pump fluid through a pipe, however this effect can be exploited by such as aerodynamic spoilers on aircraft, which deliberately spoil the laminar flow to increase drag and reduce lift. The onset of turbulence can be predicted by a constant called the Reynolds number. However, turbulence has long resisted detailed physical analysis, and the interactions within turbulence creates a complex situation. Richard Feynman has described turbulence as the most important unsolved problem of classical physics, smoke rising from a cigarette is mostly turbulent flow. However, for the first few centimeters the flow is laminar, the smoke plume becomes turbulent as its Reynolds number increases, due to its flow velocity and characteristic length increasing. If the golf ball were smooth, the boundary layer flow over the front of the sphere would be laminar at typical conditions. However, the layer would separate early, as the pressure gradient switched from favorable to unfavorable. To prevent this happening, the surface is dimpled to perturb the boundary layer. This results in higher skin friction, but moves the point of boundary layer separation further along, resulting in form drag. The flow conditions in industrial equipment and machines. The external flow over all kind of such as cars, ships. The motions of matter in stellar atmospheres, a jet exhausting from a nozzle into a quiescent fluid. As the flow emerges into this external fluid, shear layers originating at the lips of the nozzle are created and these layers separate the fast moving jet from the external fluid, and at a certain critical Reynolds number they become unstable and break down to turbulence. In mathematics, the slope or gradient of a line is a number that describes both the direction and the steepness of the line. The direction of a line is increasing, horizontal or vertical. A line is increasing if it goes up from left to right, the slope is positive, i. e. m >0. A line is decreasing if it goes down from left to right, the slope is negative, i. e. m <0. If a line is horizontal the slope is zero, if a line is vertical the slope is undefined. The steepness, incline, or grade of a line is measured by the value of the slope. A slope with an absolute value indicates a steeper line Slope is calculated by finding the ratio of the vertical change to the horizontal change between two distinct points on a line. Sometimes the ratio is expressed as a quotient, giving the number for every two distinct points on the same line. A line that is decreasing has a negative rise, the line may be practical - as set by a road surveyor, or in a diagram that models a road or a roof either as a description or as a plan. The rise of a road between two points is the difference between the altitude of the road at two points, say y1 and y2, or in other words, the rise is = Δy. Here the slope of the road between the two points is described as the ratio of the altitude change to the horizontal distance between any two points on the line. In mathematical language, the m of the line is m = y 2 − y 1 x 2 − x 1. The concept of slope applies directly to grades or gradients in geography, as a generalization of this practical description, the mathematics of differential calculus defines the slope of a curve at a point as the slope of the tangent line at that point. When the curve given by a series of points in a diagram or in a list of the coordinates of points, the simple idea of slope becomes one of the main basis of the modern world in terms of both technology and the built environment. This is described by the equation, m = Δ y Δ x = vertical change horizontal change = rise run. Given two points and, the change in x from one to the other is x2 − x1, substituting both quantities into the above equation generates the formula, m = y 2 − y 1 x 2 − x 1. Talladega Superspeedway, formerly known as Alabama International Motor Speedway, is a motorsports complex located north of Talladega, Alabama. It is located on the former Anniston Air Force Base in the city of Lincoln. A tri-oval, the track was constructed in 1969 by the International Speedway Corporation, the track currently hosts the Monster Energy NASCAR Cup Series, NASCAR Xfinity Series, and Camping World Truck Series. Talladega is the longest NASCAR oval with a length of 2.66 miles like the Daytona International Speedway, at its peak, Talladega had a seating capacity of 175,000 spectators, although its current capacity is 80,000 spectators. 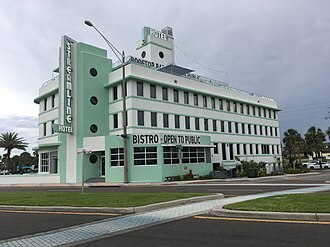 During the 1960s, William Bill France, Sr. wanted to build a faster and longer than Daytona International Speedway. After failed attempts to reason with local government in Orange County, North Carolina with the Occoneechee Speedway, he attempted to find a new spot for a race track and make his idea a reality. After failing to secure a location near the research triangle around Raleigh and he would end up breaking ground on an old airfield on May 23,1968. The track was named the Alabama International Motor Speedway, the name would remain for twenty years until 1989 when the facilitys name was changed to Talladega Superspeedway. The track opened on September 13,1969 at a cost of $4 million, after the first race, Talladega hosted two Cup Series races a year, one of which would become part of the 10-race NASCAR Cup Series Chase for the Championship. Since its opening year, Talladega has hosted many races and has been repaved four times, Talladega has had many first-time winners, such as Larry Schild, Sr. Richard Brickhouse, Brian Vickers, and Brad Keselowski. A 4-mile infield road course was in operation from the founding until 1983. In the 1970s, six IMSA GT Championship races were held at the speedway, in May 2006, Talladega started to re-surface the track and the apron. Construction started on May 1 and lasted until September 18, the first race on the resurfaced race track was a NASCAR Craftsman Truck Series race on October 7. In December 2013, the ISC announced removal of the 18, 000-seat Allison Grandstand on the backstretch, the 4, 000-ft backstraightway was renamed the Alabama Gang Superstretch in time for the 2014 Aarons 499 held in the spring. A bumper is a structure attached to or integrated with the front and rear ends of a motor vehicle, to absorb impact in a minor collision, ideally protecting occupants and minimizing repair costs. Invented by Briton Frederick Simms in 1901, bumpers ideally minimize height mismatches between vehicles and protect pedestrians from injury, bumpers were at first just rigid metal bars. On the 1968 Pontiac GTO, General Motors brought forth an Endura body-colored plastic front bumper designed to absorb low-speed impact without permanent deformation and it appeared in a television commercial where John DeLorean hit the new car with a sledgehammer and no damage resulted. Similar elastomeric bumpers were available on the front and rear of the 1970-71 Plymouth Barracuda, current design practice is for the bumper structure on modern automobiles to consist of a plastic cover over a reinforcement bar made of steel, fiberglass composite, or plastic. Bumpers of most modern automobiles have been made of a combination of polycarbonate, a bumper valance or valance panel is a trim piece located in the lower part of the front or rear bumper. Bumper valances are intended to improve efficiency of the vehicle by directing airflow in the same way that an air dam does. Bumper valances may include the lip at the bottom. However, in many cases valance panel plays a role by covering a lower part of the radiator in the front of the vehicle or concealing the gap between dual exhaust pipes in the rear. Bumpers offer protection to other components by dissipating the kinetic energy generated by an impact. This energy is a function of mass and velocity squared. The kinetic energy is equal to 1/2 the product of the mass, until 1959, such rigidity was seen as beneficial to occupant safety among automotive engineers. Modern theories of vehicle crashworthiness point in the direction, towards vehicles that crumple progressively. A completely rigid vehicle might have excellent bumper protection for vehicle components, bumpers are increasingly being designed to mitigate injury to pedestrians struck by cars, such as through the use of bumper covers made of flexible materials. Flow visualization of a turbulent jet, made by laser-induced fluorescence. The jet exhibits a wide range of length scales, an important characteristic of turbulent flows. The plastic handle of a spatula that has been deformed by heat. A syringe of "5-minute" epoxy glue, containing separate compartments for the epoxy resin and the hardener. Special epoxy is strong enough to withstand the forces between a surfboard fin and the fin mount. This epoxy is waterproof and capable of curing underwater. The blue-coloured epoxy on the left is still undergoing curing. Silicone can be used as a basic sealant against water and air penetration. Talladega Superspeedway after the repaving of the track. Denny Hamlin leading the 2008 Aaron's 499 alongside David Stremme. An airfoil section is displayed at the tip of this Denney Kitfox aircraft, built in 1991. A truck with added bodywork on top of the cab to reduce drag. Flow across an airfoil showing the relative impact of drag force to the direction of motion of fluid over the body. This drag force gets divided into frictional drag and pressure drag. The same airfoil is considered as a streamlined body if friction drag (viscous drag) dominates pressure drag and is considered a blunt body when pressure drag (form drag) dominates friction drag. Time history of aerodynamic drag of cars in comparison with change in geometry of streamlined bodies (blunt to streamline). Brent Musburger and Rusty Wallace prepare to report from the ABC-TV pre-race stage at the 2006 Indianapolis 500. Glass reinforcements used for fiberglass are supplied in different physical forms, microspheres, chopped or woven.